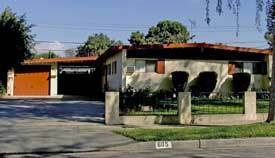 The counterpart to the Ranch style residence in California was the modern Eichler home. In 1947, pioneering San Francisco developer Joseph Eichler began building high quality and affordable middle-class residences throughout California. While Cliff May's Ranch style house looked to the past California rancho period, Eichler designed his residences with an eye to the European modernist tradition, avoiding any hint of nostalgia. 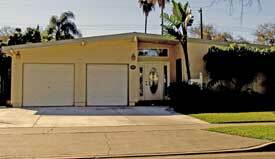 The Eichler legacy became the modern, contemporary house with a high qualify of design. Not a licensed architect himself, Eichler commissioned progressive architects, such as Ashen & Allen, Jones & Emmons, and Claude Oakland to design his homes. The architects worked on large tract developments as well as small enclaves of nine or ten homes. The majority of Eichler houses were built in Northern California, but he also built hundreds of dwellings in Southern California, most notably in Granada Hills (100 homes), Thousand Oaks (125 homes), and Orange (350 homes). There are three tracts of Eichler-styled houses in Orange, all built in the 1960s: a neighborhood south of Santiago Canyon Road along Linda Vista Street and adjacent side streets; a neighborhood north of Taft Avenue between Shaffer Street and Cambridge Street; and a neighborhood between Fairhaven and La Veta Avenues, along Woodland Street and adjacent side streets. These three subdivisions show the lasting character of the original architectural designs, as well as the many permutations created by additions over the years. In 1954, Eichler convinced architects A. Quincy Jones and Frederick Emmons to appear on the "House that 'Home' Built" segment of the NBC Home television show that came on daily after the Today Show from 1954 to 1957. On the nationally syndicated show, Jones and Emmons offered to created house plans for any developer that came up with two hundred dollars. The local building firm of Pardee-Phillips took up the challenge and constructed three tracts containing a total of 286 Eichler-styled homes, called Fullerton Grove. These tracts, built over a span of 3 years between 1953 and 1956, are located west of Richman Avenue on several streets between Valencia Drive and Orangethorpe Avenue (the model homes were on the 500 block of W. Ash Avenue ). Advertised as the "Forever House," the aluminum, glass, steel, and masonry residence sold for $13,000 to $15,000, that required a $1,250 down payment (with no down payment for veterans). Jones and Emmons offered prospective buyers of these Fullerton homes seven different floor plans ranging between 1,175 and 1,450 sq. ft. of living space on 6,000 sq. ft. lots. These one-story houses featured sliding glass doors, natural birch cabinets, a ceiling-high fireplace, and orange trees in the front and back yards. Each residence also featured the "Dream Kitchen of Tomorrow" with 14 built-in items. Eichler homes were a critical and financial success for twenty years, but when Eichler over-extended his business, his building company collapsed in 1966. He continued to build homes until his death in 1974. By the 1970s, home buyers began seeking out more historic styles associated with the well-to-do, and demand declined for housing designed in the Eichler style. In the last few years, however, these residences have become valued by grown baby boomers nostalgic for their childhood homes, as well as the next generation captivated by all-things mid-century modern. Although some of the residences in Fullerton Grove have been modified or fallen into disrepair over the last 50 years, the well-maintained ones still reflect the modernism and high design that Eichler promoted. If maintained and kept true to its original design, an Eichler home can now sell at a premium, adding many thousands of dollars to the normal price of a home within its neighborhood. Adamson, Paul, and Marty Arbunich. Eichler: Modernism Rebuilds the American Dream.Salt Lake City: Gibbs Smith, 2002. Alavosus, Laura Marshall. "California Eichlers: A Coming of Age." Old House Journal January/February 1999: 62-65. Buckner, Cory. A. Quincy Jones. London: Phaidon, 2002. Ditto, Jerry. Design for Living: Eichler Homes. San Francisco: Chronicle Books, 1995.